A collage of the various activities which took place during the picnic. Graphics by Wise Concepts. They say life is a little better when we add some sugar into it. The way I see it, making life sweeter with fun and good cheer, brings in the sweetness around us as individuals which brings sunshine and glow to the places we go. This saying is particularly very true for people who live with sickle cell anemia. They live a life characterized by pain and hospital stays and as such, many do have this dread and see the future as bleak. 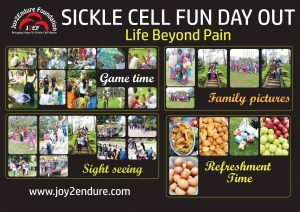 As part of my #BreakTheSilence and Taboos around sickle cell, I try to look for ways to help those living with sickle cell aim for as normal a life as possible. 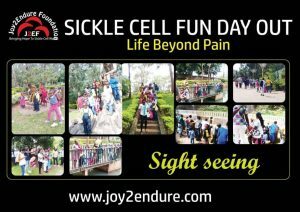 This desire was what brought forth the idea of a first ever fun day out for sickle cell warriors of the Etougebe Baptist Hospital Sickle Cell Clinic. The day began with a sight seeing with about 50 people, before we sat down for other fun activities and refreshments. We have pushed the idea much because we needed enough time to plan and scout out suitable places, free from mosquitoes and convenient for warriors. And when we finally settled for Saturday 24th November, at Bois Sainte Anatasie of the Carrefour Warda Neighbourhood of Yaounde, we grew wary when some plans didn’t get ready on time because we felt the parents would not take us serious. Nevertheless, we pulled it through despite the initial wrong starts. 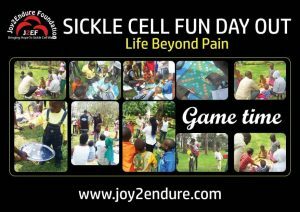 We had fun with the warriors through games such as scrabble, cards, charades, word games and we ensured they had their taste buds happy and singing melodies with the yummy bites we had. The weather was very cooperative and the sun shone brightly like we had the heavenly approval that day. It was a fun filled day. The kids were happy and some excitedly and eagerly spoke about their dreams for the future. While some of the parents were happy, we realized that others were not comfortable with the idea of their kids being interviewed on TV… hmmm yes… the picnic drew in a crew from the National TV Station CRTV. The journalist had previously contacted me weeks before that they would love to interview me . 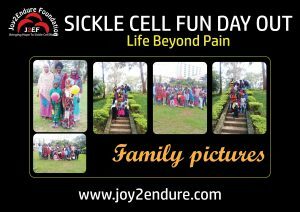 We did have to apologize to these parents but we also used the opportunity to emphasize that talking is all about the desire to break the silence and taboos around sickle cell and that they need not make their children or themselves feel shame and uncomfortable about a genetic blood disorder. Freshments. healthy choices because eating healthy doesn’t have o be boring. 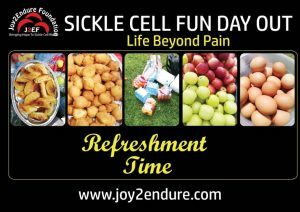 I was asked why I decided to have the picnic and I simply said so the kids have fun and understand that it is possible for them to aim for a very normal life beyond hospital and pain, to understand there can also be joy in endurance, to see life beyond pain. I also had to emphasize the importance of knowing our genotypes so as to make informed decisions, take care of ourselves and sickle cell children because this would go a long way to demystify the condition and so, stop people from attributing it to witchcraft, hence stigmatizing the warriors and their families. In all, along with the incredible help from Dr Mike and Mrs Olivia Acha-Morfaw, it was a great time we hope to repeat as the funds allow. We equally remain grateful to all who contributed in one way or another to make this maiden fun day out a success. We hope you enjoyed reading this. Let is know what you think, Thank you. Next Flow With Me As I Go Back to Recap 2018.